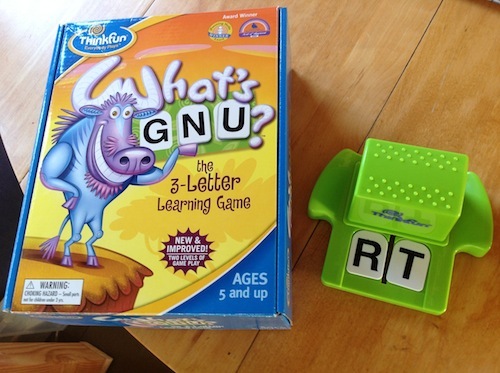 Long ago, we were given the game “What’s Gnu?” as a gift. What better time to dig it out than in the waning days of summer leading up to the return of school? So Tabitha (six years old) and I did just that a couple weeks back. Neither one of our children has been an early reader. They both love books. They are highly verbal with substantial vocabularies. And neither one has ever wanted to read aloud. I am not worried about this. But “What’s Gnu” is all about reading words aloud. This presented a problem. We played “War” with letters. See that green mechanism to the right of the box in the picture? That is a letter dispenser. You move it back and forth, dispensing two letters at a time. In our game, we took turns dispensing (it’s totally fun). Tabitha’s letter was on the left each time, mine was on the right. Whoever had the letter that came first in the alphabet won the round, taking both letters. Largest number of letters at the end of the game wins. We discussed strategies for knowing who won each round. Tabitha described some version of each of the following strategies. Middle/end. Example: M and X. M is in the middle of the alphabet; X is at the end. Therefore, M comes first. Recite alphabet from the beginning. This comes in two versions: (a) stop reciting at the first of the two letters, and (b) stop reciting at the second of the two letters. This one is useful for two letters that are in the same part of the alphabet. Example: H and N (both can be seen as in the middle of the alphabet). Recite alphabet from the letter you think is first. This is a more efficient version of strategy 2. Example: L and P.
Adjacent. When two letters are next to each other in the alphabet, you can know right away. This may just be a very quick version of 3. Example: H and I.
ABYZ. These letters are so close to the beginning (or end) of the alphabet that they MUST be first (or last), no matter what the other letter is. There are relationships to something called subitizing, which refers to knowing how many things there are without counting. You can recognize three objects, and probably also four, without counting or grouping them. But five objects you cannot; you probably group them as three and two without even noticing it. How psychologists measure this fact is super-interesting but not pertinent here. Instead, notice that strategies 4 and 5 above are like that. Tabitha could recognize adjacent letters without thinking or reciting the alphabet. Reciting the alphabet is like counting. Similarly A, B, Y and Z she could compare to other letters without reciting. But here’s the point. This counts as talking math. We were comparing the order of things. Letters, like numbers, have an order. Anytime we are talking about how we know what order things come in, we are talking math. I did mention that product reviews would not take the usual form on this blog, didn’t I? This entry was posted in Product review and tagged 6 years old, alphabet, gnu, order, Tabitha, what's gnu. Bookmark the permalink. This is brilliant. It also reminds me of another early childhood set of strategies that is directly mathematical: the ones kids use for simple addition of two numbers (generally single digit + single digit, but sometimes two-digit + one-digit and vice versa. If children are still using such strategies by the time they reach two-digit + two-digit and beyond, they haven’t yet figured out place-value, regrouping, and the standard addition algorithm, in all likelihood). Very young children tend to add, in ways that reflect not knowing addition facts. Asked to say how many candy bars two kids have in total if Anne has seven (shown with seven counters) and Bjorn has nine (also shown with counters), children will sometimes count the seven, then the nine, or the nine and then the seven, but will always start with one. A more sophisticated strategy, called “counting-on” is like some of what you describe above with letters. When students have begun to understand commutativity and realized that the order of the addends doesn’t matter, more sophisticated students will take the larger of the two piles as “given” and “add on” the smaller pile to the larger, thus saving maximum time with this approach. It may not be possible to take the alphabet questions quite so far for young children, but some pretty cool questions lurk just over the horizon having to do with addition and subtraction. For example, how many letters are there between, say, “J” and “P”? How many letters must I count to get from “J to P?” Will those be the same? If all the letters from “J” to “P” are in my pocket, how many letters do I have in my pocket? Will that be the same as in the previous questions? Why or why not? I can see a lot of great thinking coming out of this game.